Nuclear energy provides almost 20% of all electricity in the United States. It is available 24 hours a day, emits no greenhouse gasses or criteria pollutants, and once built is extremely inexpensive to operate. To date, the hurdles for nuclear have been high capital costs and concerns over waste management. But today, over one hundred nuclear reactors operate domestically,1 have a strong record of safety,2 and provide clean energy in areas of the country, especially the South and parts of the Midwest,3 with growing demand and limited access to other clean energy sources. Every new nuclear reactor could create up to 3,500 new construction jobs per plant and up to 700 permanent jobs.4 Given its benefits and manageable challenges, nuclear energy should be treated by the federal government as a critical energy resource. Record-low natural gas prices in the U.S., the high cost of building new light water reactors, and continued concerns about waste security and disposal have made development of new nuclear facilities very difficult. Today, only two nuclear reactors are under construction, both at the Vogtle plant in Georgia. The current loan guarantee authority of $18.5 billion5 should be sufficient to generate private capital interest in four new reactors. Yet, the private capital markets have made clear that at least two to three plants or 4 reactors need to be built on time and on budget in order to provide some certainty to the private capital markets.6 Without those plants and the federal investment to jump start them, private financing of large nuclear projects will be difficult. Congress should fund the nuclear loan guarantee program at the $54.5 billion level requested by President Obama in his Fiscal 2011 budget request15 which received bipartisan support.16 In conjunction with this increase, the revolving program should include a sunset that eventually transfers the risk of default to newly constructed plant owners. While the optimal number required for this consortium to adequately spread the risk still needs to be determined,17 the effect of this transfer would be to move these expensive reactors off the books of the federal government and allow private industry to be self-sufficient. Congress should reduce the time it takes for the NRC to certify reactor design and review applications by increasing NRC funding to hire more full-time employees. The design certification process currently takes 36-60 months to complete.18 It is critical that NRC maintains its independence and rigor, yet this regulatory delay contributes to the burgeoning costs of borrowing capital from private-capital markets. Increasing funding and staff could reduce roadblocks within the NRC that drive up the costs of license renewals and new deployment.19 This would ensure that nuclear generation remains safe and the gold standard of the NRC is maintained, while at the same time facilitating the rollout of safe nuclear plants. The next Quadrennial Energy Review (QER) should include a roadmap for nuclear power generation in the U.S. The QER will advance a long term energy plan and as such is an appropriate place to affirm a strong federal commitment to nuclear power. United States, Department of Energy, Energy Information Administration, “Energy in Brief: What is the Status of the U.S. Nuclear Industry,” Report, December 14, 2012. Accessed March 20, 2013. Available at: http://www.eia.gov/energy_in_brief/nuclear_industry.cfm. Despite the public perception that nuclear power is dangerous, it is estimated that nuclear power has saved 1.8 million lives. See Mark Schrope, “Nuclear Power Prevents More Deaths Than It Causes,” Chemical & Engineering News, April 2, 2013. Accessed April 2, 2013. Available at: http://cen.acs.org/articles/91/web/2013/04/Nuclear-Power-Prevents-Deaths-Causes.html. See also David Ropeik, “Beware the Fear of Nuclear…FEAR!,” Scientific American, March 12, 2011. Accessed March 20, 2013. Available at: http://blogs.scientificamerican.com/guest-blog/2011/03/12/beware-the-fear-of-nuclear-fear/. 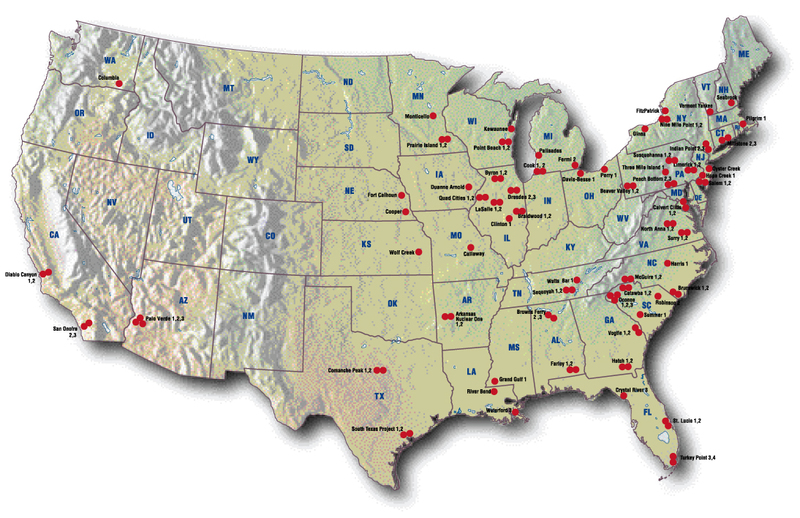 World Nuclear Association, “Nuclear Power in the USA,” Report, April, 2013. Accessed April 2, 2013. Available at: http://www.world-nuclear.org/uploadedImages/org/info/Country_Profiles/Countries_T-Z/us_nuclear_map.jpg. Nuclear Energy Institute, “Nuclear Power Plants Contribute Significantly to State and Local Economies,” January, 2012. Accessed April 2, 2013. Available at: http://www.nei.org/Key-Issues/New-Nuclear-Energy-Facilities/Economic-Benefits-of-New-Plants. United States, Department of Energy, Loan Guarantee Program Office, “Loan Guarantee Solicitation Announcement: Federal Loan Guarantees for Nuclear Power,” Report, p.3, July 11, 2008. Accessed April 2, 2013. Available at: https://lpo.energy.gov/wp-content/uploads/2010/09/NuclPowerSol7-11-08Amend1.pdf. Analysts argue that to overcome a history of delays and stoppages in nuclear reactor development, at least two plants must be built on time and on budget to encourage private markets to become open to financing large reactors. See Joel Kirkland and Peter Behr, “Obama Ups Administration’s Ante for Nuclear Power Plant Incentives,” Climatewire, February 1, 2010. Accessed April 2, 2013. Available at: http://www.eenews.net/climatewire/2010/02/01/archive/5?terms=nuclear. Yet, if natural gas prices remain near $3.00 it will be difficult to encourage private investment in anything other than natural gas projects, barring clean energy mandates either at the state or federal level. United States, Executive Office of the President, Office of Management and Budget, “Fiscal Year 2011 Budget of U.S. Government” Report, p.70, February 1, 2010. Accessed April 2, 2013. Available at: http://www.gpo.gov/fdsys/browse/collection.action;jsessionid=1TjNRbCHxyJhSxpvjYhTXdsWNWwGSqQGwJJLWD2GSG0QxWMwJ7nL!279060247!509948888?collectionCode=BUDGET&browsePath=Fiscal+Year+2011&isCollapsed=false&leafLevelBrowse=false&isDocumentResults=true&ycord=0. Based on comments made by Secretary of Energy, Steven Chu. See Nuclear Energy Institute, “NEI Congratulates Energy Dept., Southern Co. on Issuance of Conditional Loan Guarantee,” Press Release, February 2, 2010. Accessed April 2, 2013. Available at: http://www.nei.org/newsandevents/News-Releases/nei-congratulates-energy-dept-southern-co-on-issua. Calculations based on deployment of eight AP 1000 reactors with a nameplate capacity of 1117 MW. See Westinghouse, “AP1000: Simple, Safe, Innovative,” Report, 2007, p. 3. Accessed April 2, 2013. Available at: http://www.westinghousenuclear.com/docs/AP1000_brochure.pdf. Mathematical analysis based on data from the Energy Information Administration (EIA) on average home energy use and the likely energy generated by 8 GW of geothermal at its capacity factor of 91% from EIA’s Annual Energy Outlook 2012. See United States, Department of Energy, Energy Information Administration, “Frequently Asked Questions: How Much Electricity Does an American Home Use?” Accessed March 4, 2013. Available at: http://www.eia.gov/tools/faqs/faq.cfm?id=97&t=3; See also United States, Department of Energy, Energy Information Administration, “Levelized Cost of New Generation Resources in the Annual Energy Outlook 2012,” July 12, 2012. Accessed March 4, 2013. Available at: http://www.eia.gov/forecasts/aeo/electricity_generation.cfm. Housing unit figures based on 2010 census data. See United States, Department of Commerce, Census Bureau, “State & County QuickFacts,” Accessed March 4, 2013. Available at: http://quickfacts.census.gov/qfd/index.html. Calculations based on data from the Energy Information Administration on capacity factor of energy, and peer reviewed analysis of GHG output by energy source. See “Levelized Cost of New Generation Resources in the Annual Energy Outlook 2012,” Table 1; See also, Benjamin Sovacool, “Valuing Greenhouse Gas Emissions from Nuclear Power: A Critical Survey,” Article, Energy Policy, June 2, 2008, p. 2950. Print. Marilyn Kray, “Long-Term Strategy for Nuclear Power,” Report, Pew Center on Global Climate Change 10-50 Workshop, March 24-25, 2004, p. 5. Accessed March 4, 2013. Available at: http://www.c2es.org/docUploads/10-50_Kray.pdf. “Fiscal Year 2011 Budget of U.S. Government,” p. 70. Amongst others, Sen. Lamar Alexander (R-TN), Judd Gregg (R-NH), and James Connaughton, former Chair of Council on Environmental Quality under President George W. Bush, both praised the move. See Katherine Ling, “What Does $36B Buy Democrats?” Environment & Energy Daily, February 9, 2010. Accessed April 2, 2013. Available at: http://www.eenews.net/EEDaily/2010/02/09/archive/1?terms=nuclear+54.5. See also Joel Kirkland and Peter Behr, “Obama Ups Administration’s Ante for Nuclear Power Plant Incentives,” Climatewire, February 1, 2010. Accessed April 2, 2013. Available at: http://www.eenews.net/climatewire/2010/02/01/archive/5?terms=nuclear. Based on initial conversations with nuclear industry officials, we anticipate this number to be around 20 reactors. See New Millennium Nuclear Energy Partnership, “A Strategy for the Future of Nuclear Energy: The Consolidated Working Group Report,” Report, June 2012, p. 12. Accessed April 2, 2013. Available at: http://www.thirdway.org/subjects/9/publications/540. Nuclear Energy Institute, “Licensing New Power Plants,” October 2010. Accessed April 2, 2013. Available at: http://www.nei.org/resourcesandstats/documentlibrary/newplants/factsheet/licensingnewnuclearpowerplants/?page=1. See “A Strategy for the Future of Nuclear Energy: The Consolidated Working Group Report,” p. 5-6. This refers to the Combined Construction Permit and Operating License Process (COL). See 10 CFR 52.103(g), 2007. Accessed September 23, 2014. Available at: http://www.nrc.gov/reading-rm/doc-collections/cfr/part052/part052-0103.html. Matt Bennett, Josh Freed, and Jeremy Ershow, “Breaking the Nuclear Financing Barrier,” Idea Brief, Third Way, February 2010, p. 5. Print. Accessed September 23, 2014. Available at: http://www.thirdway.org/subjects/9/publications/265. Dual-use (or multi-use) items can be used both for nuclear power generation and nuclear weapons manufacturing. To see how regulatory responsibilities break down See United States, Export.gov, “Civil Nuclear Guide to Exporting,” Accessed April 4, 2014. Available at: http://export.gov/civilnuclear/index.asp. United States, Department of Energy, National Nuclear Security Administration, “Proposed Changes to DOE Part 810,” August 2013, Slide 20. Accessed September 23, 2014. Available at: http://nnsa.energy.gov/aboutus/ourprograms/nonproliferation/programoffices/officenonproliferationinternationalsecurity-3-0. This includes Japan, South Korea, and Russia. See James Glasgow, Elina Teplinsky and Stephen Markus, “Nuclear Export Controls: A Comparative Analysis of National Regimes for the Control of Nuclear Materials, Components and Technology,” October 2012, p. 12. Accessed September 23, 2014. Available at: http://www.pillsburylaw.com/publications/nuclear-export-controls. United States, Government Accountability Office, “Government-wide Strategy Could Help Increase Commercial Benefits from U.S. Nuclear Cooperation Agreements with Other Countries,” Nuclear Commerce, November 2010, pp. 11-12. Accessed September 23, 2014. Available at: http://www.gao.gov/products/GAO-11-36.